For years, I’ve seen those peanut butter cup cookie recipes circulating online around holiday time. You know the ones. The peanut butter cookies with a miniature peanut butter cup pressed in the middle. I usually just pass them by, but this year, I thought, why not make them dairy-free with homemade chocolate candy cups? Better yet, I can even make them top allergen free for everyone to enjoy! And thus, these sun butter cup brownies were born. This post is sponsored by Enjoy Life Foods, makers of the most awesome top allergen free treats. Yes, that opinion is my own. So is the recipe for these stellar, if I do say so myself, vegan & gluten-free sun butter cup brownies. But wait, I thought we were talking about peanut butter cookies? In the comments of one of those traditional peanut butter cup cookies, someone mentioned that they are even better made with brownie batter. I happened to have an Enjoy Life Gluten-Free & Allergy-Friendly Brownie Mix on hand, so it seemed worth a try. Of course, I couldn’t stick to just one version of these Sun Butter Cup Brownies. On my first test batch, I made what I thought was enough of the sun butter cups to fill all of the brownie batter cups. But little did I know how many treats just one box of the brownie mix would make! I actually ran out of enough chocolate to make another batch of the sun butter cups. Chocolate shortages happen a lot around here, as we have a bit of a dairy-free chocolate chip snacking habit. But rather than run to the store, I thought I would test out straight-up sun butter middles. I sprinkled the tops with the few mini chips that I had left, and another delicious dessert was created. The latter version is a bit easier and faster, should you be in a time crunch, too. No peanut allergies? If peanuts aren’t a concern for your dessert needs, you can use peanut butter instead of sunflower seed butter. These treats are vegan, gluten-free, nut-free and soy-free for all to enjoy. 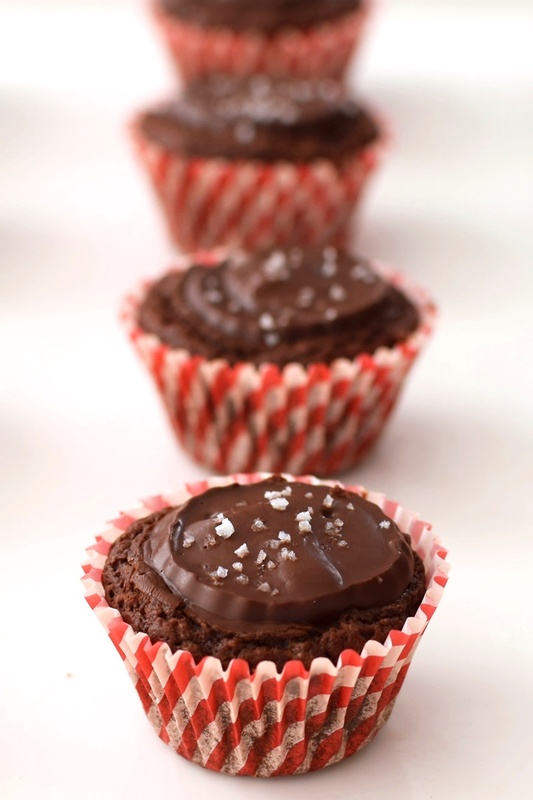 I've included a traditional chocolate cup version as well as an easier and faster sun butter-in-the-middle version that we think is equally delicious. In a small bowl, stir together the sunflower seed butter and powdered sugar, to taste. Place in the refrigerator to chill while you prepare the other ingredients. If making the chocolate cups, melt the chocolate with the oil. Fill candy cup silicone molds about ⅓ full with the melted chocolate. 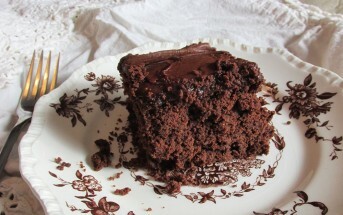 Brush the chocolate up the sides with a small pastry brush, a toothpick, or whatever works for you. Remove the seed butter from the refrigerator. Pinch off small amounts and roughly shape into pieces that are about ½-inch in diameter. Drop one into each chocolate cup. Top the chocolate cups with more chocolate to cover and surround the seed butter. Place in the freezer for 15 minutes to quickly set up. Preheat your oven to 350ºF and grease or line mini muffin tins. You can make in batches, if needed. Prepare the brownie mix as directed to make the batter. 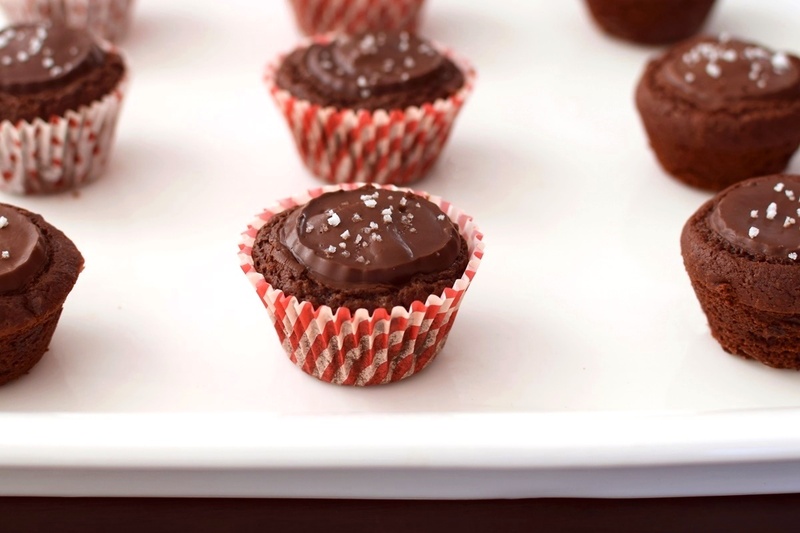 Fill the prepared mini muffin cups about ⅓ to ½ full with the brownie batter. 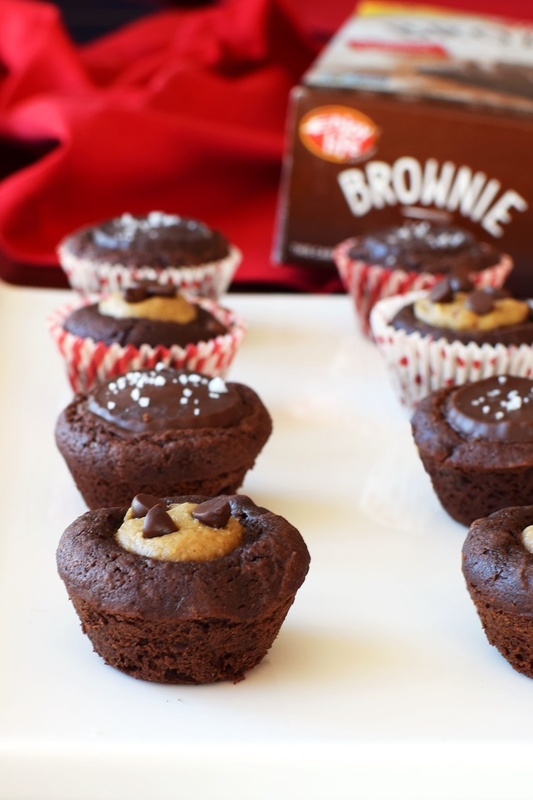 If making the chocolate cup brownie version, press a chilled chocolate cup into the middle of each brownie batter cup. It should be mostly surrounded by the batter. Garnish with coarse sea salt. If making the sun butter-in-the-middle brownie version, simply pinch off pieces of the chilled sun butter mixture and roll into balls about ½-inch or slightly larger in diameter. Press a ball into the middle of each brownie cup. It should be mostly surrounded by the batter, but I like it peaking out. Garnish with mini chocolate chips. Bake for about 13 minutes. Let cool for 15 minutes in the pans before removing to a plate to cool completely. If you want the middles to be firm, you can chill the brownies in the refrigerator. Omg, I just died! These look so heavenly and beautiful. What a great idea for a party, too! I have tried their brownie mix too, it’s good! Thank you! They are definitely perfect little bites for a party – and such a fun alternative to regular cookies! I love the treat-within-a-treat thing going on! Both versions look incredible. This is my husbands absolute FAVORITE combination. I’ll definitely have to make this some time! I made thumbprint cookies with Enjoy Life chips last year. They were a hit! These look great, Alisa. I bet they were! You’ll have to share the link if your recipe is online. These are adorable. I have yet to find a substitute for Sunbutter. I am allergic to any alternatives: soy, peas, and sunflower seeds. What I could use instead? That’s a tough one Kortney. Are you allergic to coconut, too? Pumpkin seeds? We were in need of an indulgence, too, as they’re all gone. So addictive. I have a chocolate and sunbutter cupcake recipe that’s one of our favorites but I’m loving the brownie base! Looks great. Ooh, cupcakes, that sounds marvelous! I’ll have to try that, too. These look absolutely amazing! I know my son would go crazy for them! Thanks for the great, safe recipe! 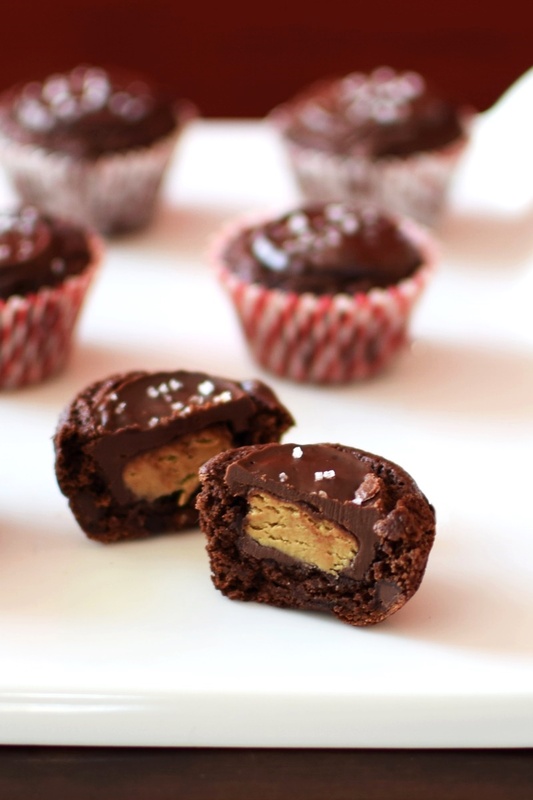 I love how easy these sun butter brownie cups are and I have an Enjoy Life mix to make them! Yes!!! Sweet! That mix is so darn handy. I have many ideas circulating in my head for using it! Wow, these look incredible! I am a big fan of the sun butter, I cant’ wait to try this! These look SO GOOD! I love the sea salt on top! Thanks Laura! I couldn’t resist the sea salt on top for both adding contrast to the dark chocolaty look and for flavor. Can’t resist salted chocolate. These both look so delicious, I can’t decide which looks best. Guess that means I must try them both!! Yep, I think that does Cricket! Alisa! This looks dreamy! The chocolate nut/seed butter combo is always legit. Love your different versions. Agreed, it’s pretty darn hard to go wrong with that flavor combo. These are delicious! I just love sunflower seed butter and of course anything chocolate! These look so delicious! 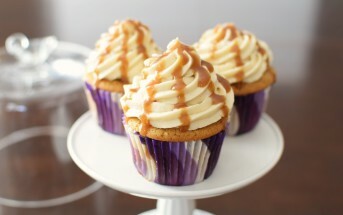 I’d love them with peanut butter, but I love how you made them allergy and diet friendly for everyone! 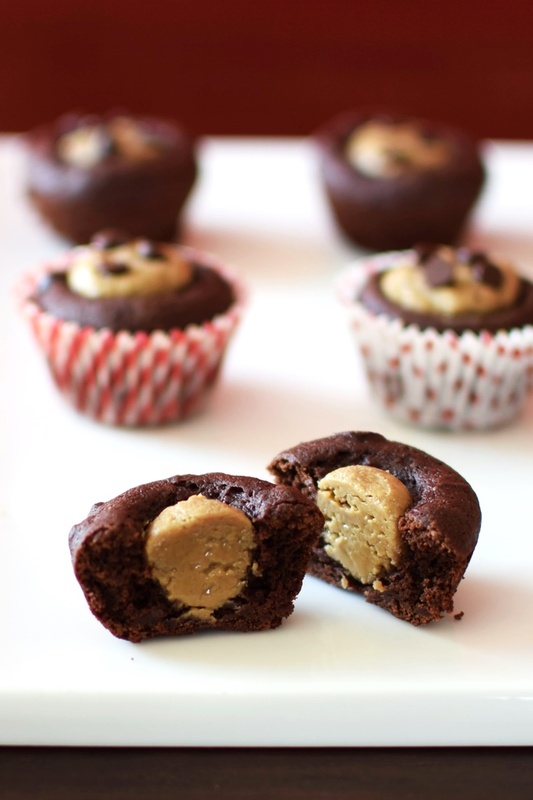 Yep, definitely a pb-chocolate win for those of us who can eat peanut butter, too! A friend’s daughter is actually tree nut allergic, but can eat peanut butter – you just never know! These look so simple! I have to try that brownie mix! The brownie mix is DEFINITELY a winner Maria. 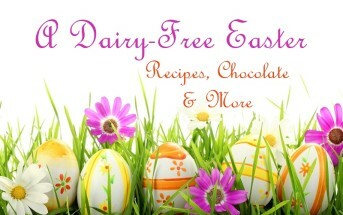 I honestly can’t believe it’s egg-free, let alone gluten-free and top allergen-free. I used to make those cookies. I love how you’ve veganized them and made them allergy-friendly! My goodness these look good Alisa! I’ll take a couple please, chocolate and peanut butter is always going to be one of my favorite combos! These look so good! I love that it’s peanut-free. Thanks Becky! Love being able to share nut-free love, too.